Overlord is the only series that actively encourages players to have fun being the embodiment of evil, destroying all that is good in a subversive, comedic manner. Fellowship of Evil captures this essence and adds in four-way, chaotic co-op play where gamers can even turn on each other. Evil always finds a way...sometimes it just needs a bit of a nudge. Series signature dark, mischievous humour Award-winning scriptwriter Rhianna Pratchett returns with a twisted and hilarious tale of evil, chaos, Minions and the burning desire to destroy all things good! Invade. Smite. Loot! Work your way through the Netherworld and unleash hell on the world above! Trample the weak under your evil size 10s with fun and satisfying combat, combining unique abilities and melee attacks to dominate all who stand before you! Share loot or steal the spoils- how far are you willing to go in the Trials of Evil? Four times the players, four times the fun! Evil has a new face. Well, four faces, actually. But who wears the evilist? Er, eviler? You decide! Pick from any of four distinct Netherghul characters, each with unique abilities. Play as a team, or screw each other over – evil never plays by the rules! © 2015 The Codemasters Software Company Limited (“Codemasters”). All rights reserved. “Codemasters”®, the Codemasters logo® and “Overlord” ® are registered trademarks owned by Codemasters. 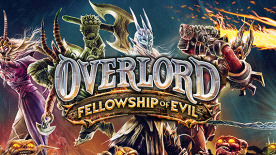 “Overlord: Fellowship of Evil”™ is a trademark of Codemasters. All other trademarks or copyrights are the property of their respective owners and are used under license. Developed and published by Codemasters. Created with Unity. ©Unity Technologies. Audio powered by Fabric.